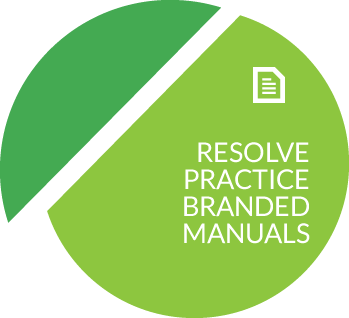 Introducing Resolve’s Branded Practice Manuals – a personalised individual approach! Are you struggling to get your dental business structured and organised? Do you feel you are always reacting to situations rather than being proactive? Do you have a bulky generic practice manual sitting on the shelf gathering dust? Would you like all your individual practice policies and procedures in one place? Do you lack time to personalise your practice policy manual? Would you like a system that is written specifically for your practice? If you answered YES to any of the above questions, then our Practice Branded Manuals are for you! Every business is different, therefore every procedure and policy relates to your business in a different way from the next. A standard, generic Dental Practice Manual may not relate to your business as well as it should and that is where Resolve Dental Management Solutions can help! Communication and cohesive business practices ensure an organised environment. It is important that your staff clearly understand the procedures and policies with which your dental business has been founded. Understanding this will ensure that all your clients receive an excellent standard of care and communication throughout their experience at your practice. Recording your specific procedures and policies in one place is an important step to ensure the highest level of care is achieved by all. We will gather information from you about your business and then personalise your Practice Branded Manuals, making them unique and specific to your dental business. The Manuals will include your logo and your individual policies, making them completely relevant to your business and your staff. All you need is your company logo and a bit of information about your practice. Just fill out this questionnaire and the order form, and we can get started on your personalised Branded Practice Manuals immediately! We have two easy ways to pay: either by a one-off fee or convenient instalments over a 12- month period.